Use the Bandwidth Calculator to find the right product for your business. Core functionality: plug and play wizard, programmable login page, authentication, disclaimer editor, access code generation, content filtering, bandwidth control, advanced firewall, usage and billing reports, PayPal® and credit card billing, facebook™ Login, URL filter, MAC filter, configuration backup/restore and access code API. Core functionality: plug and play wizard, programmable login page, authentication, disclaimer editor, access code generation, content filtering, bandwidth control,firewall, usage and billing reports, facebook™ Login, URL filter, MAC filter, configuration backup/restore and access code API. 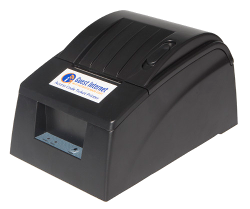 The GIS-TP1 adds access code ticket printing to any GIS hotspot gateway product. The ticket printer has an Ethernet interface and connects to the gateway's LAN network. A tablet computer can be used to control the printer. Buttons are displayed on the tablet screen for up to 10 different access code durations. Touching any button causes the ticket to be generated and printed.